original plan in 1841 in Vienna. The photo was taken in his native town of Varaždin. It is kept in the Museum of Arts and Crafts in Croatia's capital Zagreb, as well as the guitar. and dedicated to Mr. J. V. de Bobrowicz by Jean Padovetz). in return dedicated one of his guitar pieces to Ivan Padovec. 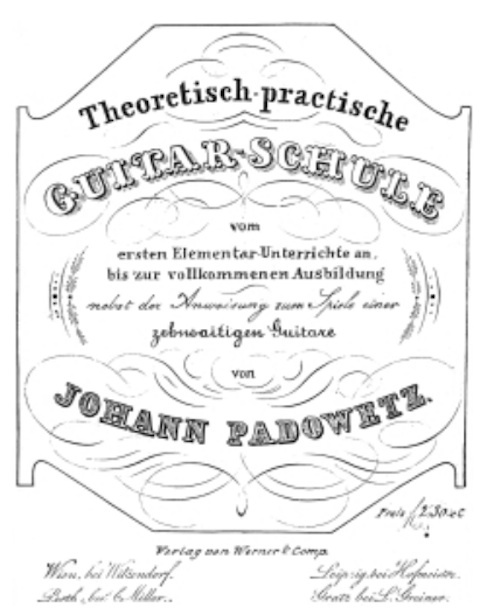 (Guitar school by Johann Padowetz for his ten string guitar, published in Vienna in 1842 in German, 31 pp). Source of the photos is Mirko Orlić: Ivan Padovec, hrvatski gitarist europskog ugleda [PDF], Gitara 2, 2000. 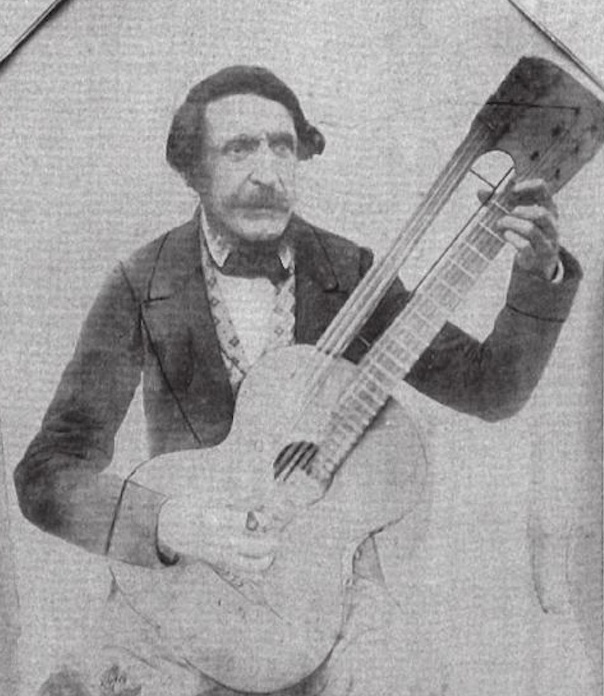 Rođen u Varaždinu, gitarist i skladatelj Ivan Padovec (1800./1873.) u gitari je bio samouk, dok je glazbenu teoriju učio u Zagrebu kod Jurja Karla Wisner Morgensterna. Od 1829. do 1837. godine djelovao je u Beču. Kao jedan od posljednjih europskih gitarista svojega doba s velikim je uspjehom koncertirao u domovini i inozemstvu (Beč, Graz, Prag, Brno, Budimpešta, Frankfurt na Majni, Hannover, Hamburg, London i dr.). Pisao je skladbe za gitaru, najviše varijacije i fantazije na popularne operne teme. U svojim se vokalnim djelima, solo pjesmama uz gitaru ili klavir, uspješno približio duhu hrvatske narodne pjesme. Mnoge Padovčeve skladbe izdao je nekad poznati bečki nakladnik A. Diabelli. 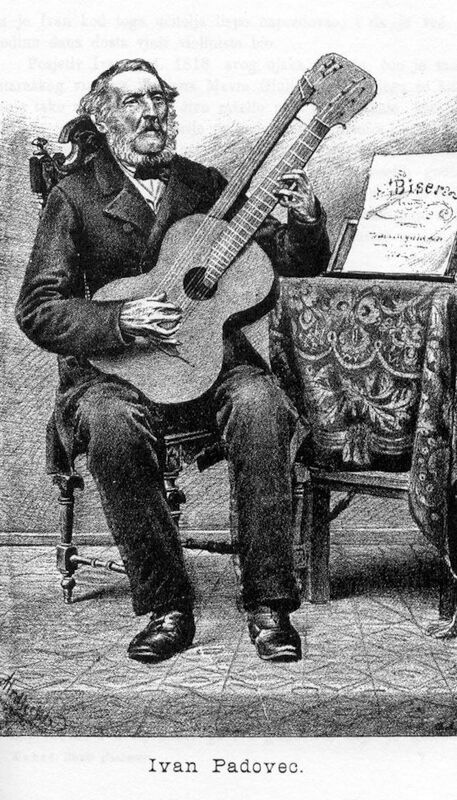 Guitarist and composer Ivan Padovec (1880-1873) was born in Varaždin, Croatia. Juraj Karl Wisner Morgenstern passed his music theory knowledge on I. Padovec in Zagreb. From 1829 to 1837 Ivan Padovec played in Vienna. As one of the last European guitarists of his time, he perfomed with great success at concerts in his homeland and abroad (Vienna, Graz, Prague, Brno, Budapest, Frankfurt, Hannover, Hamburg, London, etc.). He wrote compositions for a guitar, mostly variations and fantasies on popular operatic themes. In his vocal works, solo songs with guitar or piano, he successfully approaches to the spirit of Croatian folk songs. Many Padovec's compositions were released by once famous Viennese publisher A. Diabelli. dedicated to the life and work of the legendary Croatian composer. 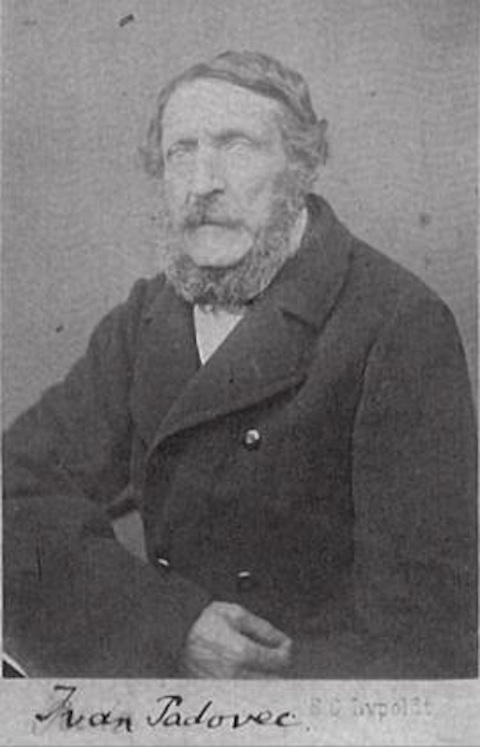 Ivan Padovec was born in Varaždin, Croatia in 1800. He was among the first professional Croatian guitarist/composers with an international reputation. He gave successful concerts both at home and abroad, and composed over 200 compositions, instrumental (mostly for one and two guitars) and vocal (songs for different voices accompanied by guitar or piano). Many of his compositions were published during his lifetime, by well-known publishers in Vienna, Prague, etc. But some of his works were kept in his, or his friends’ handwriting, like "Polonaise in La-major", one of the most famous short Padovec pieces. Our particular attention was caught by our countryman Mr. Padovec, the composer and the best guitar virtuoso, who was not deprived of praise even by the severe critics in Vienna. He performed two concerts in the city theatre and showed that even on such an instrument, it was possible to play tenderly and skillfully, thus surpassing everyone else. All the pieces he played were very successful, but his own variations on the folk song “Nek se hrusti” were most appreciated. In 1848 Padovec lived in the family house of his sister, facing financial problems. As he was now completely blind, he could neither compose nor teach. Despite this he still tried to make some music, which was dictated to his friends. Later, the scores were checked, corrected or rewritten by Ivan Udl, an organist from Varaždin, and Padovec’s friend. 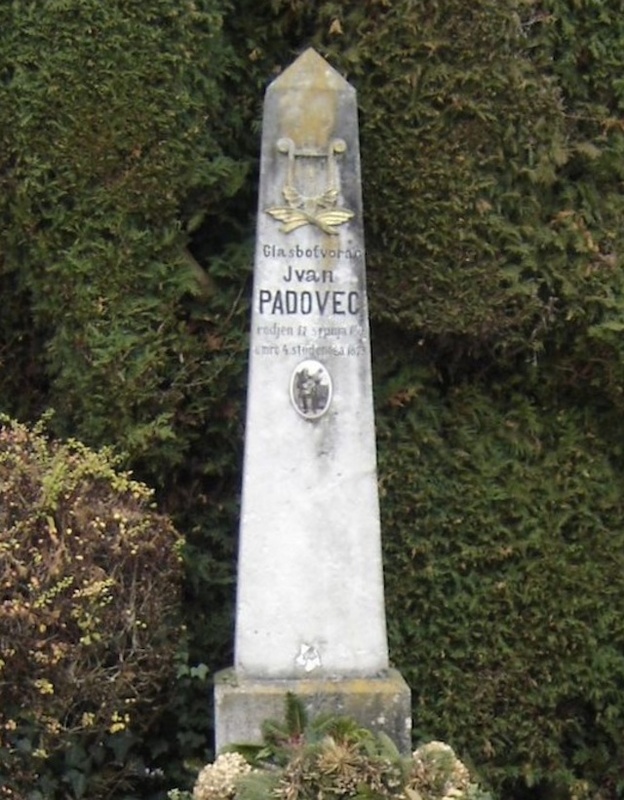 At the end of his life Padovec lived in great poverty. He did receive some financial support, but this was insufficient. 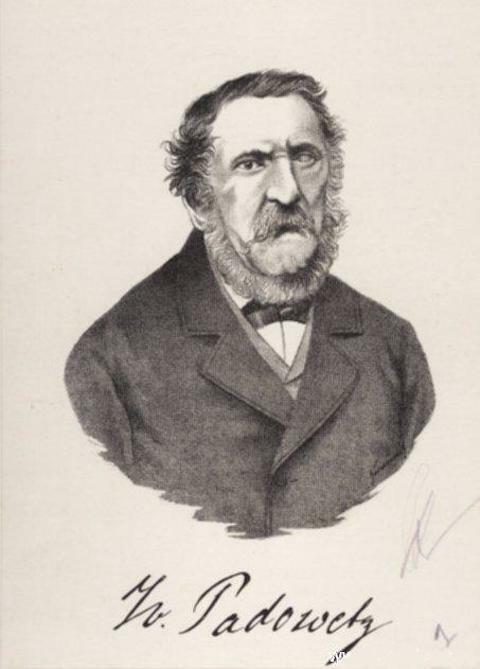 In 1871, Padovec gave his last performance in the Varaždin theatre. A journalist commented on this in the magazine Vienac: "Just like a candle which gathers its strength and flames up, before finally going out, the weak, vulnerable old man gathered all his strength and gave his final concert last year in the Varaždin Theatre." On November 4, 1873 Ivan Padovec died, leaving no children, for he never married. His humble funeral was attended by the youth from the country school, and a few singers. Later, his admirers erected a monument to him in the city of Varaždin. 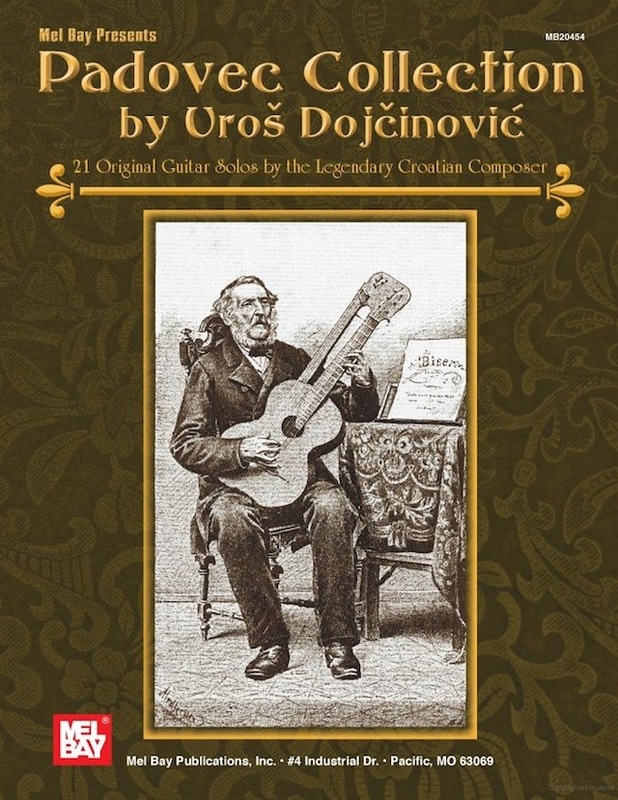 The published contents of the greatest Croatian XIX century guitar composer and performer, Ivan Padovec's, complete biography, collection of all known photos, and unpublished solo pieces without opus numbers. 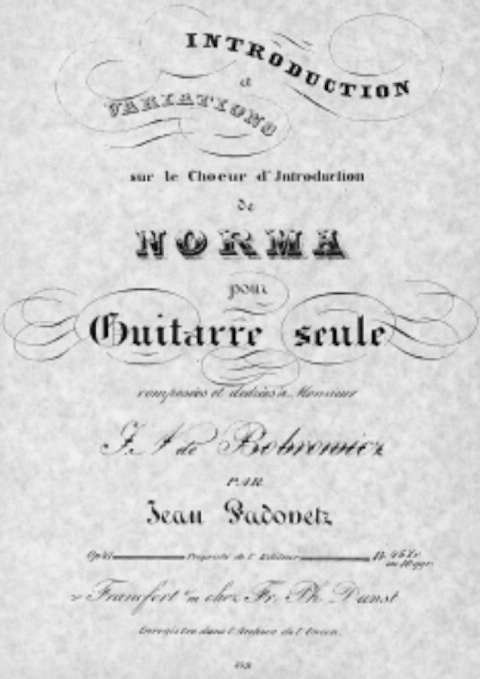 They range from his more-easy, short didactic compositions, done for his numerous guitar students, to a number of miniatures, dances and themes, with variations of a medium technical difficulty, and finally a few pieces for more advanced players. The entire collection is based on the music, which for more than 120 years was totally unknown outside of Padovec's country, Croatia, and mostly lost or forgotten and never published. Presents biographical notes, as well as Padovec's portraits and other illustrations, with all pieces found in his own manuscript or handwriting of his closest pupils and friends. They are the result of more than 25 years of Mr. Dojcinovic's research. This is the first collection of Padovec's music ever to be published! Mirko Orlić: Ivan Padovec, hrvatski gitarist europskog ugleda [PDF], Gitara 2, 2000. The Croatian musician Darko Petrinjak graduated in double-bass from the Academy of Music in Zagreb, as well as in guitar and lute from the Royal Academy of Music in London. He made a successful career as a soloist and chamber musician, and in 1984 he founded the renowned Zagreb Guitar Trio. He has given guest performances all over the world, and he is also active as a jury member at international guitar competitions and a masterclass teacher. His extensive repertoire gives a prominent position to the Croatian composers and many of them have dedicated their compositions to this musician. He taught at the Birmingham School of Music, and since 1982 he has been teaching at the Music Academy in Zagreb. Ivan Padovec was born in 1800 in this house in Varaždin, north of Croatia's capital Zagreb. The house in which Ivan Padovec, Croatian composer and artist, was born and died. Placed in 1900, on the occasion of centennial of his birth, by the Croatian singing society "Fairy". The street of Ivan Padovec in Varaždin. 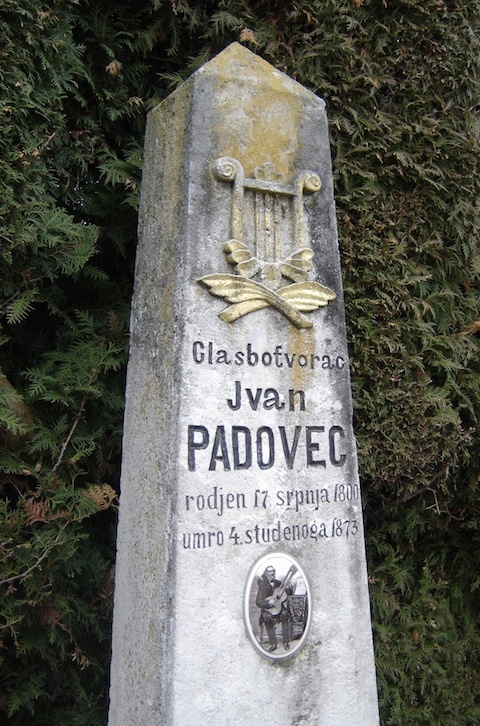 The grave of Ivan Padovec in Varaždin.